Art Projects returns to London Art Fair 2019 offering a platform for emerging galleries to showcase the freshest contemporary art from across the globe. Now in its 15th edition, the section brings together 33 galleries from 11 countries showcasing the most stimulating and innovative contemporary art practice today. Included in Art Projects are six unique collaborations, known as Dialogues, with pairs of galleries invited to display their artists in conversation with each other. A major feature of Art Projects is Dialogues, which invites pairs of galleries to create a shared presentation, encouraging inventive collaborations and new relationships. This year, for its 6th edition, Dialogues is curated by Kiki Mazzucchelli, an independent curator and writer based in São Paulo and London, and focuses on the various correspondences between the work of contemporary artists from Latin America and Europe through a series of international collaborations between six pairs of galleries. The re-evaluation of hegemonic art historical narratives has been at the forefront of art historical debates in the past two decades. In this context, the legacy of Latin American avant-gardes has gained unprecedented recognition, with artists such as Héilo Oiticica, Lygia Clark and Cildo Meireles from Brazil having had a major influence on the work of emerging artists worldwide. Featuring works by a younger generation of artists from the region, alongside international names, Dialogues highlights their shared interest in a wide variety of issues that include, amongst others, the subversion of Modernist canons and the innovative approach to painting by female artists on both sides of the Atlantic. 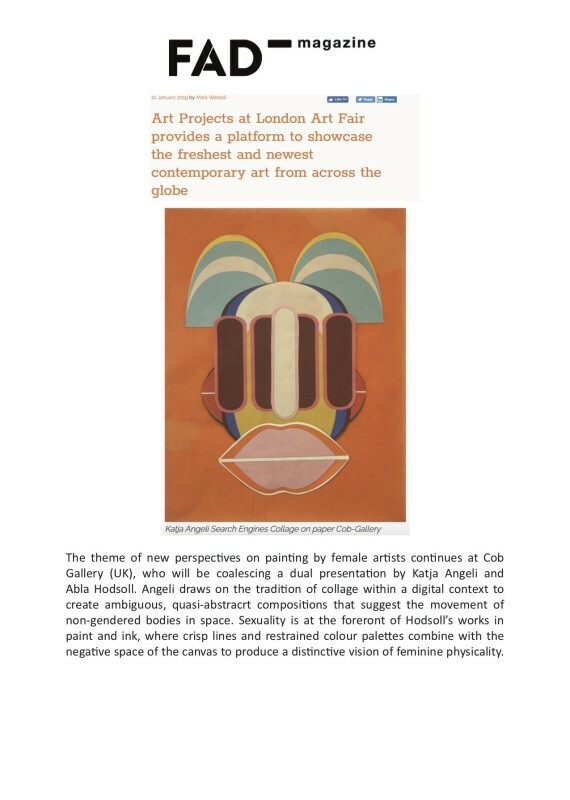 The theme of new perspectives on painting by female artists continues at Cob Gallery (UK), who will be coalescing a dual presentation by Katja Angeli and Alba Hodsoll. Angeli draws on the tradition of collage within a digital context to create ambiguous, quasi-abstract compositions that suggest the movement of non-gendered bodies in space. Sexuality is at the forefront of Hodsoll’s works in paint and ink, where crisp lines and restrained colour palettes combine with the negative space of the canvas to produce a distinctive vision of feminine physicality.